As far as hotel restaurants go, the Bird and Bone at The Confidante is definitely up there. It’s super low-key, has excellent service (and should for an automatic 20% across Miami), and the food. Oh. the. food. And the name, cheeky AF, so you know I love it. Over a three-day weekend, I managed three meals. The first was a just-off-the-plane quick breakfast. I wanted something heavier than healthy and less than a huge egg plate. 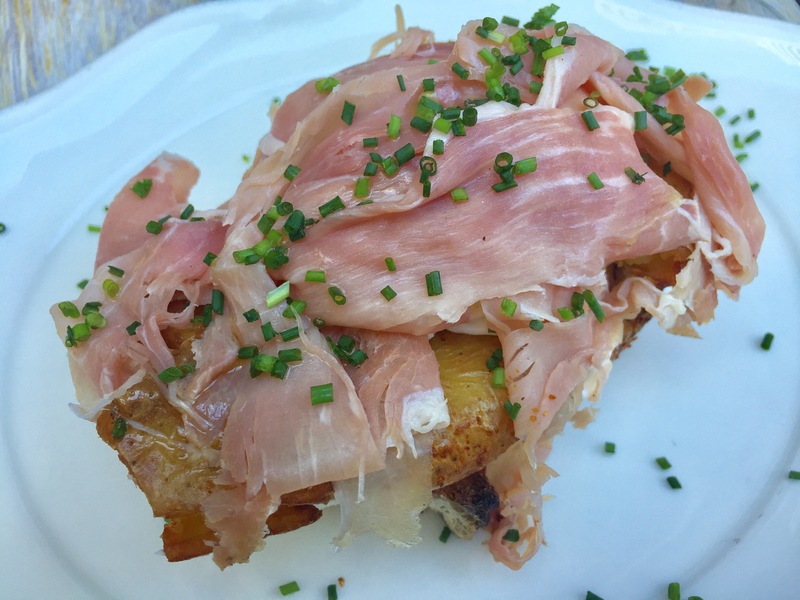 My cheery waitress recommended “ham toast.” It consisted of a giant piece of Zak the Baker’s bread. Topped with chive spread! Topped with potatoes! Topped with a poached egg! Topped with ham! Heavennnnnnnnnn……….. Oh and this was like $12 which is a relative steal at Miami hotel restaurant brekkie prices. The next day. Oh, the next day. It was a very, long, very fun day of drinking wine in the sunshine with my friends. I headed home early to try Bird and Bone’s Nashville chicken, their signature move. This was hands down the best fried chicken my poor arteries had ever tasted. Hot, juicy, dripping in mustard, sprinkled with pickles, and seated atop more Zak the Baker bread. Brined for two days prior to frying, it was sooo juicy, and whatever angel dust is in the batter made is soooo crispy. Mmmmm. Since I’m a dainty lady, I ordered it via room service where it was brought up promptly and I was able to eat it in the comfort of my comfy bed, crispy bits, sprinkling the sheets. My final night, I returned to the restaurant. I had to try those damn cast iron biscuits and of course they delivered. For dinner, I attempted something not fried and had the snapper and veggies. It was tasty, but nothing like the signature move. Then, since it was the last night of vacation, I had to have dessert and opted for the strawberry buckle cake. 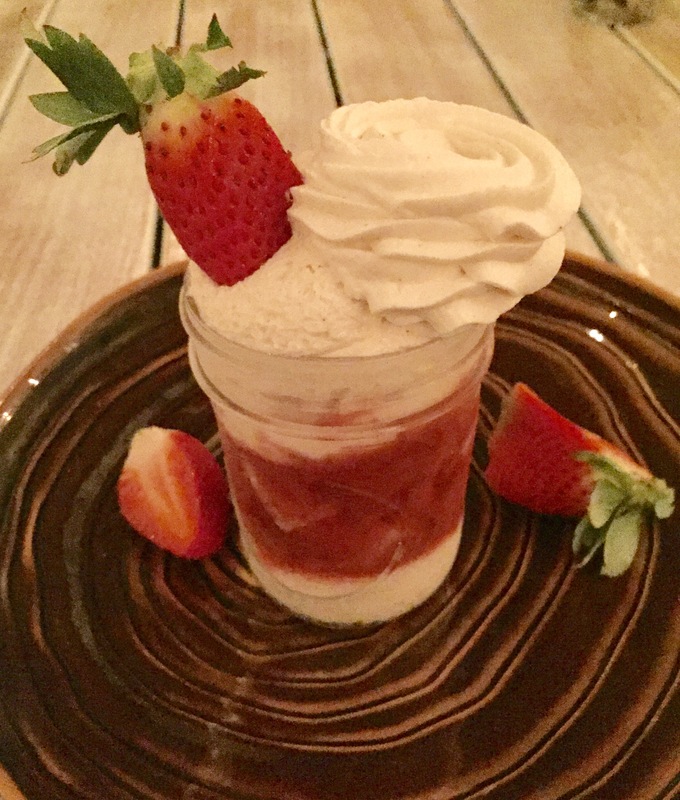 This was sheer heaven – strawberry goodness, layered with a cheesecake mousse, and whipped cream. “Cheeky AF” – good alternate blog name or great alternate blog name?